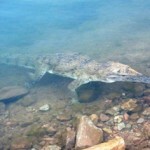 A Kununurra resident has photographed a saltwater crocodile near Carlton Gorge. Aboriginal Rangers and the Department of Parks and Wildlife will work to remove the animal. DPaW says its staff will remove problem crocodiles from Kununurra and Broome rather than kill them. The former Wyndham crocodile farm is selling all of its stock to a Darwin crocodile farm. All 30 animals have been bought and are expected to be used as breeding stock. A 3.5 metre crocodile closed Cable Beach to swimmers over the weekend. Wyndham crocodile farm is winding down operations, partly because of lack of water. Rainfall has been too low over the last couple of years to fill the croc farm dam. The owner hopes to sell the animals to a potential new crocodile farm in Kununurra. Otherwise they would have to be sold to a zoo in the south, or worse still, sold for hides. Crocodiles are appearing in such numbers now that a permanent trap is to be installed at Dampier Creek. Four men spent the night perched in mangrove trees to avoid crocodiles after their dinghy overturned on Sunday. A helicopter was able to rescue them during a break in the weather on Monday morning. Police say they are lucky to be alive, and should never have gone fishing in such bad weather. A Dornier search aircraft, send to find them from Darwin, had had to turn back because of the storms.